The ‘brain exchange’ of both highly-educated emigrants and immigrants remains a significant threat to an Irish recovery according to a new report. 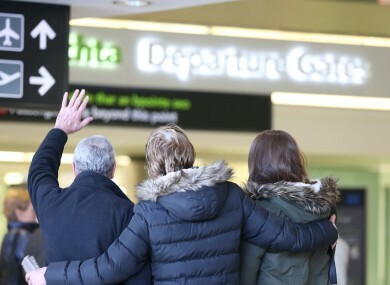 ONE SIXTH OF people born in Ireland are now living abroad according to a new report. The Organisation for Economic Co-operation and Development’s (OECD) latest economic survey of Ireland shows that regardless of our economic recovery our country remains “exceptionally open to migration flows”. With immigration also providing the skills that our economy needs our population remains highly responsive to “changes in cyclical conditions”. The biggest challenge for Ireland right now is to remain attractive for skilled workers according to the report’s findings with immigration versus emigration acting as something of a ‘brain exchange’ at present with those leaving and those coming in operating off similar skillsets. As things stand Ireland tops the poll of 34 OECD countries with 17.5% our people born here currently living abroad. New Zealand, Portugal and Mexico are next in line with 14%, 14%, and 12% respectively. The countries with easily the lowest percentages are China, the US, Japan and Brazil with less than 2% each. Meanwhile Ireland stands second only to Spain as regards OECD countries who have seen significant change in their ratios of native to foreign-born populations between 2001 and 2011.
the decline in our younger cohort – most previous examples of mass emigration from Ireland were dominated by the 15-24 age group; however the current instance sees mostly those aged between 25 and 44 leaving the country. The smaller numbers of younger people in our economy has stymied our competitiveness according to the report. As such net migration is expected to remain negative in the short term (primarily because both those leaving and those coming in are educated to a high standard), at least beyond 2016, although the OECD does acknowledge that predicting such trends is ‘significantly uncertain’. 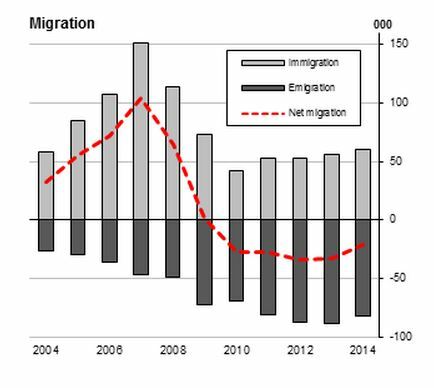 The most recent figures on migration from the Central Statistics Office (CSO), from April 2014, suggest that emigration is beginning to slow, although an analysis of that data shows that the numbers have remained relatively stagnant from 2013. The OECD report broadly contradicts the government’s prediction, made in April of this year, that 2016 would be the year when immigration would finally trump emigration. However, the report is at pains to emphasise that return migrants could yet play a “significant role” in the recovery of Ireland’s economy. “Evidence shows that return migrants bring back skills, networks and financial capital,” the report states. They can also be an important source of entrepreneurship for ireland, as a significant proportion of return migrants tend to start a business or arrange independent employment after their return. Email “The economy may be on the up, but one in six people born here still live abroad”. Feedback on “The economy may be on the up, but one in six people born here still live abroad”.